Critical Race Studies, Transnational Feminisms, Black Feminist Thought, African Canadian History, Oral History and the History of Education in Canada. 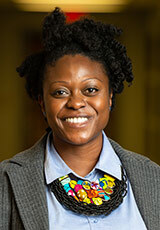 Funké Aladejebi researches African Canadian history and holds a PhD in Canadian History from York University. Her dissertation titled, ‘Girl You Better Apply to Teachers’ College: The History of Black Canadian Women Educators in Ontario, 1940s – 1980s, won the Mary McEwan Memorial Award for outstanding feminist scholarship at York University (2017). She is currently working on two major book projects; the first of which is a manuscript that explores the importance of Black Canadian women in sustaining their communities and preserving a distinct black identity within restrictive gender and racial barriers. In an attempt to contribute to historical analysis on black identity, citizenship and racial difference in Canada, this book project investigates the ways in which black Canadian women confronted and navigated socially constructed boundaries of racial alienation, limited institutional support and inequality within Ontario school systems. She is also currently co-editing a collection of essays titled, Unsettling the Great White North: African Canadian History, which explores the histories of African Canadian, Canadian, and African Diasporic communities across chronological, regional and thematic subjects. Funké Aladejebi has also published articles in Ontario History and Education Matters. “‘Send Little Outbursts Across the School’: Black Women Teachers and Micro-Resistive Strategies in Ontario Schools, 1960s – 1980s.” Education Matters Vol 4, No 1 (2016): 16-22. “‘We’ve Got Our Quota’: Black Female Educators and Resistive Pedagogies, 1960s-1980s.” Ontario History Vol. 107, No. 1 (Spring 2015): 113 – 131. “‘I didn’t want to be anything special. I just wanted to teach school’: A Case Study of Black Female Educators in Colchester, Ontario, 1960.” Southern Journal of Canadian Studies, Vol. 5, no.1-2 (December 2012), 146-159. Unsettling the Great White North: African Canadian History, co-edited with Michele A. Johnson. “Black Women Teachers in Ontario and the Limitations of Women’s Liberation, 1960s – 1980,” in Second Wave Feminism and the History of Emotions, eds. Lara Campbell, Michael Dawson, Catherine Gidney. University of British Columbia Press. “Writing Black Canadian Women’s History: Where We Have Been and Where We Are Going,” co-authored with Karen Flynn in Reading Canadian Women's and Gender History, University of Toronto Press.